Just a 2 hour flight from Manila is Taiwan. 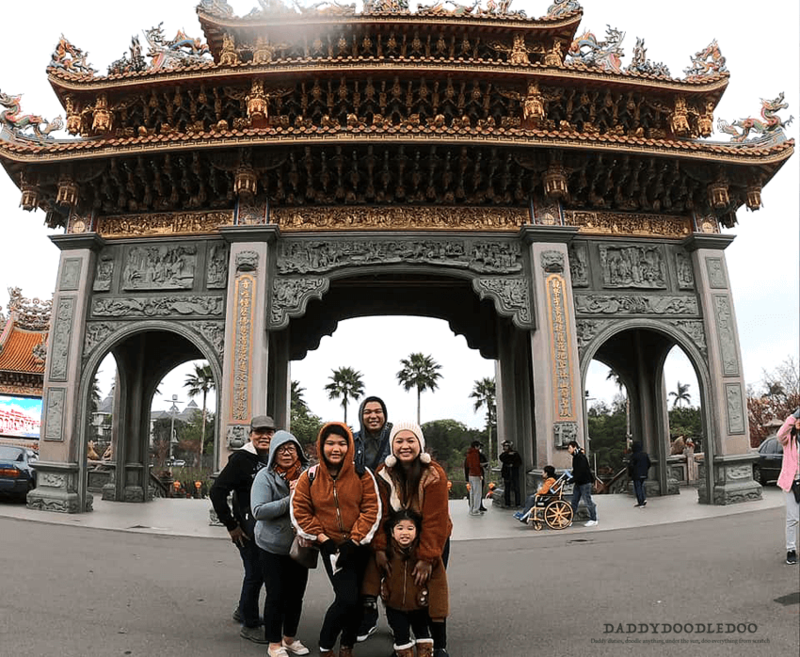 Taiwan is our first out of the country vacation as a family of four. And I want to thank Ate Myra and her husband Wang for the hospitality they have given us, Mabuhay to both of you. Our place is just 20 km away to the airport but it took us two hours just to get there because of the truck congestion at the Manila port area. 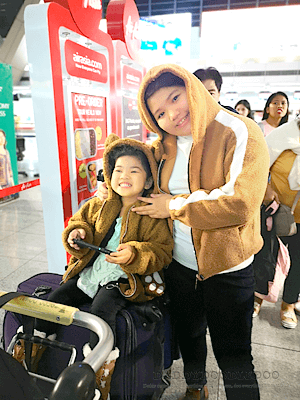 We manage to arrive at the airport around 5 am Manila time. Our flight is at 730 am Manila time it is customary here in the Philippines to a lot at least 3 hours just to go through check in counter,immigration into the boarding gate. With 2 hours and 30 minutes to spare we thought it was enough but it was not enough thanks to the long lines at the immigration just not enough counters available plus the lack of walkalators at hall going to the boarding gates. Just missing the last call for boarding we were able to make it still with our sense of adventure intact. Thanks to my wife and her ate who were the ones responsible for fixing our seating arrangement. 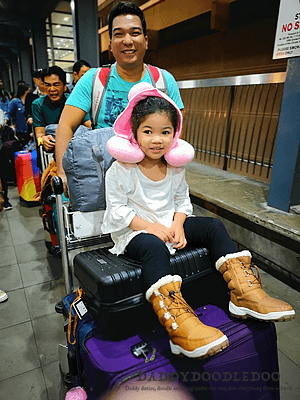 We were curious on how our youngest daughter will respond to her first time on riding an airplane. We were delighted to see that she was not afraid instead she was excited. 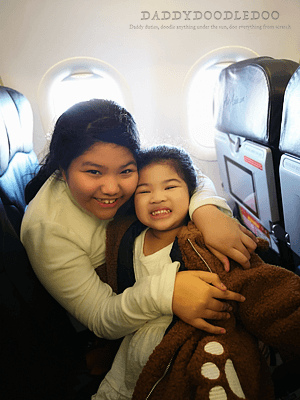 With a little encouragement from her big sister she playful and in good spirit the entire flight. 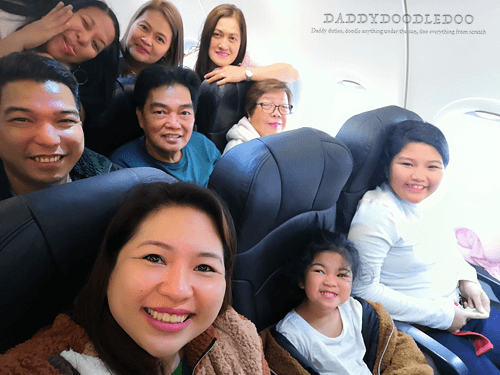 We arrived in Taiwan Taoyuan International Airport late because of the delay departing the Philippines. 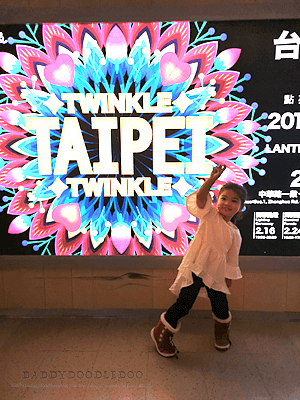 This airport is the closest international airport to the capital Taipei. After alighting from the airplane we proceeded to immigration with ease. Guiding us was numerous signs with English translation a long the way. Before immigration there is a booth were you can find the immigration paper provided are numerous pens and reading glasses just there for passengers convenience. Immigration counters are plenty plus the line is orderly. Around Taiwan you will find lots of Vending machine for different merchandise. 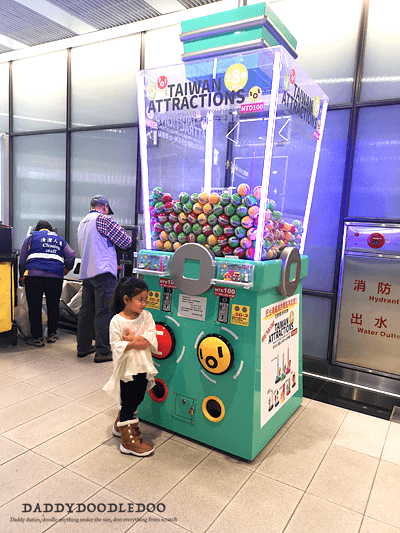 Our first encounter was at the train station that is directly connected to the airport, the first one sells little Taiwan attractions toy souvenirs and the second one are books. 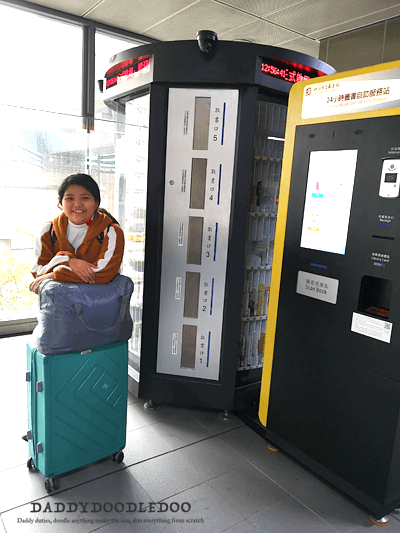 After dropping off our luggage at our accommodation in Linkou district Taoyuan city. We were not about to waste the rest of the day. We went and visited Zhulin mountain Buddhist temple one of plenty temples around Taiwan. 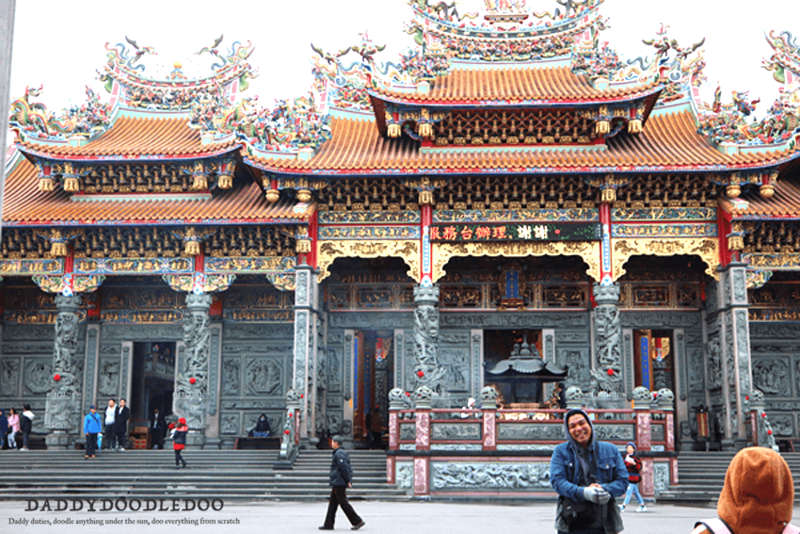 It is a huge temple with elaborate design around the walls and ceiling depicting Buddhist religious stories. The ceiling inside the temple was spectacular it’s just a shame that I don’t have a picture to show you. 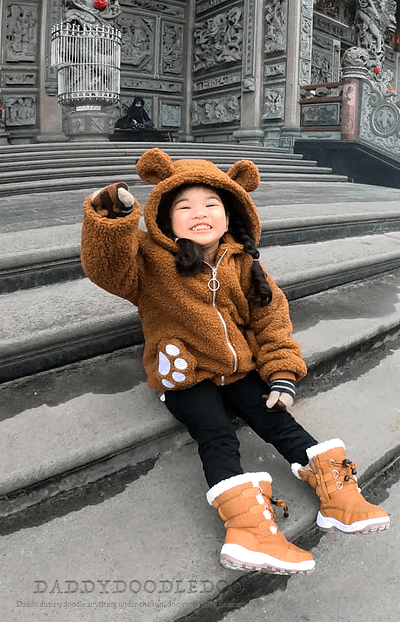 Little children are not allowed inside the temple to preserved the solemnity of the place and respect the people praying inside. So Twinkle and me stayed outside enjoying the cold climate that we are not really accustomed too. 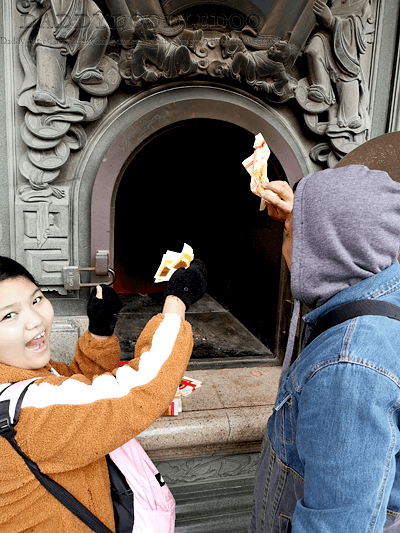 After going inside the temple my eldest daughter Purple wanted to burn Joss paper or ghost money at a burning tower just outside the temple. We decided to give it a try, we ask for blessings and had a good time trowing papers inside burning pit. Outside the temple are there are street vendors you can buy Taiwanese snacks for pasalubong and consumption as well. Only are few are open when we came there because it was an ordinary day. 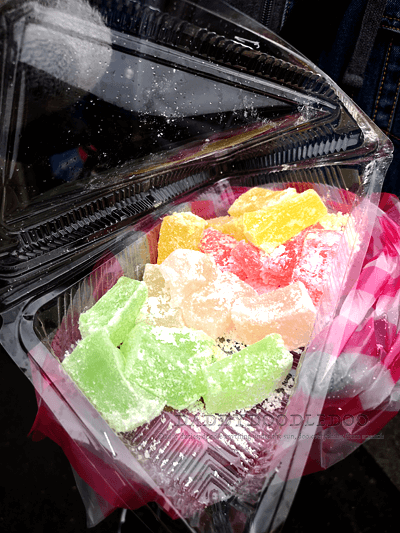 One of them where selling what seems like tapioca cubes smothered in powder sugar, my youngest daughter loved it I think for her it was like gummy bears. 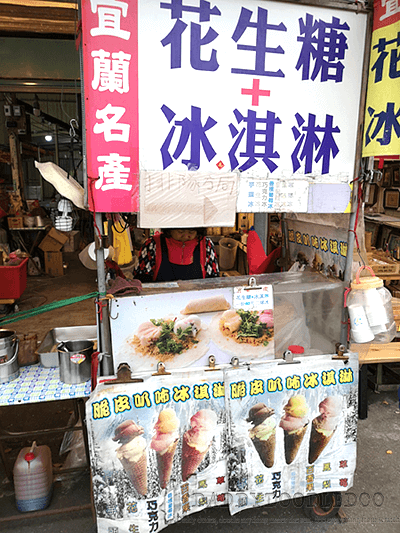 Another street food vendor was selling Taiwanese home made ice cream which is traditionally served wrapped lumpia wrapper with cilantro and crushed peanuts, it was something different a must try Taiwan street food. 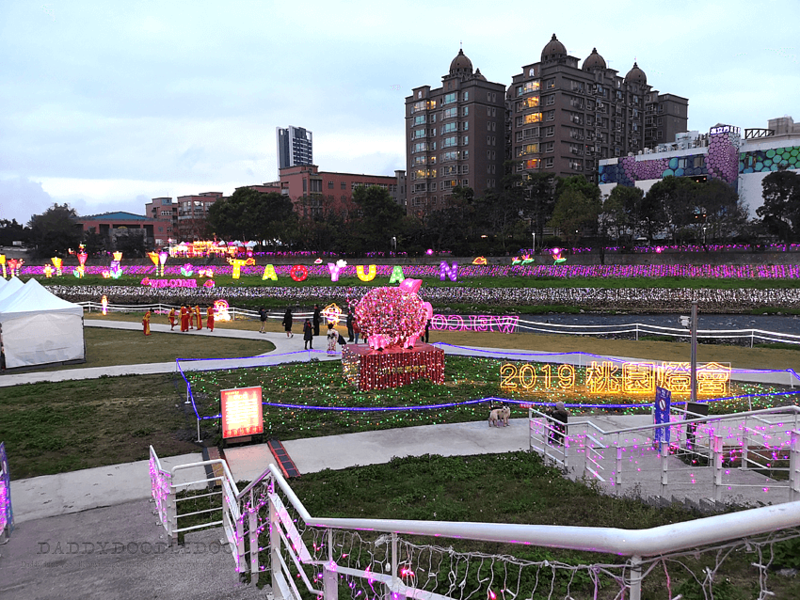 Out last destination for the day was a lantern festival beside Nankan river in Taoyuan city. Our Uber driver was super friendly. He mentioned that there was another lantern festival and it was much more bigger. On the opposite side of the river was a bunch of street food vendor. 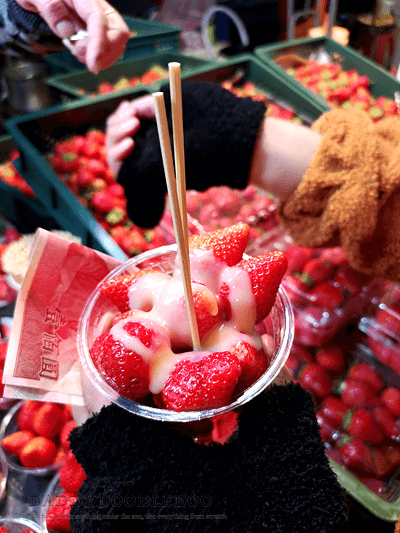 One stall was selling native strawberries top with condensed milk it was sweet and of course delicious. 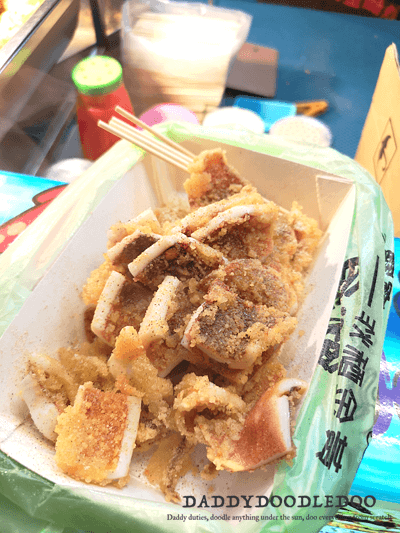 There was one stall selling fried squid chopped and dressed with different sauces you can choose from, the vendor was friendly and encourage pictures to be posted in social media to help her promote her stall. You can see her post for the camera at this picture. 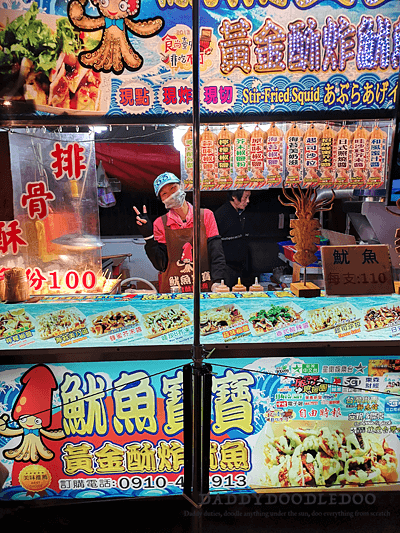 Her stall was my favorite the squid was just perfectly cook it was delicious. 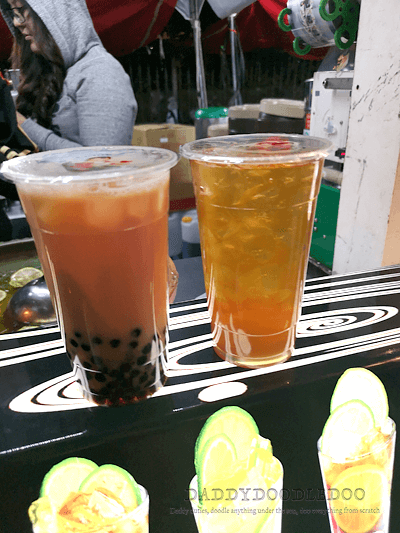 Being in Taiwan is not complete without drinking tea or Milk tea. 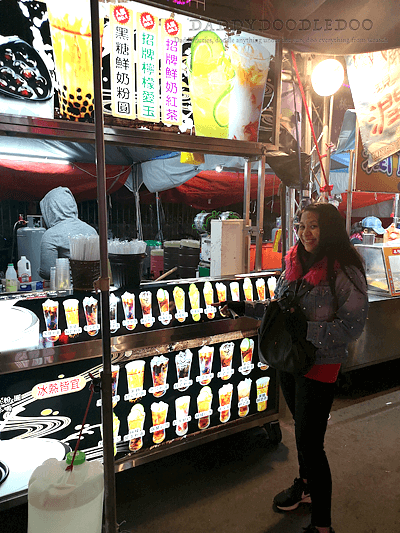 At this stall was our first taste of authentic Taiwan Milk tea and fruit tea. And it was delicious as well it will be the first of our milk tea adventure in Taiwan. End of day one. Taiwan does not have Grab what they use is Uber so better get your Uber ready, they accept cash but credit card is a better option. Getting a taxi cab is not that hard if you don’t want to use Uber. But one thing to remember they are very strict in the number of persons inside the car and even little kids are counted. Most of the cars are fits four people, if you are more than four get ready to get two cars. And also while most of the young Taiwanese speak English still a some do not better have google translate ready or have a print out of your itinerary in their language for better communication. I almost forgot better get a sim card at the airport they are selling sim cards good for 3 days, 5 days or more. And it already includes data or internet service.